Home renovation and transformation can be tiring and time consuming but if you know the right place to shop, it will all be a breeze. 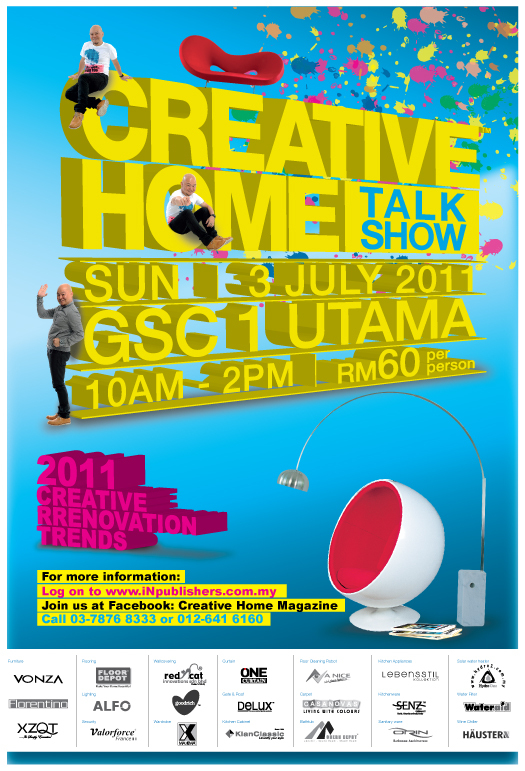 iN Publisher Sdn Bhd, Malaysia's active and innovatice home lifestyle publisher, launched it's very first home fair - Experience @ 1 Utama Idea Show 2011 on 29th June 2011. 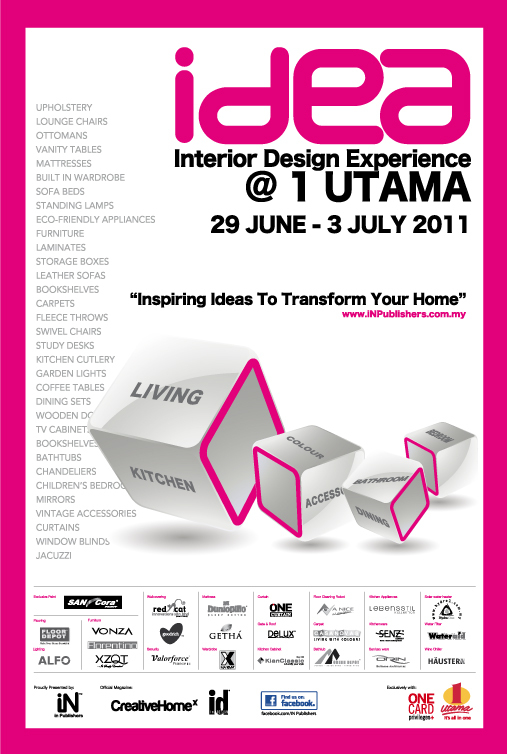 Jointly organized with 1 Utama Shopping Centre, IDEA 1 U is spread strategically across two floors and will run from Wed 29th June till Sun 3rd July 2011. IDEA 1 U aims to guide consumers though a compact and complete easy shopping experience whilst exhibiting Klang Valley's top home solutionindustry players. Consumers will also find that the exhibitor's booths are divided according to the home space, to create a hassle free layout. 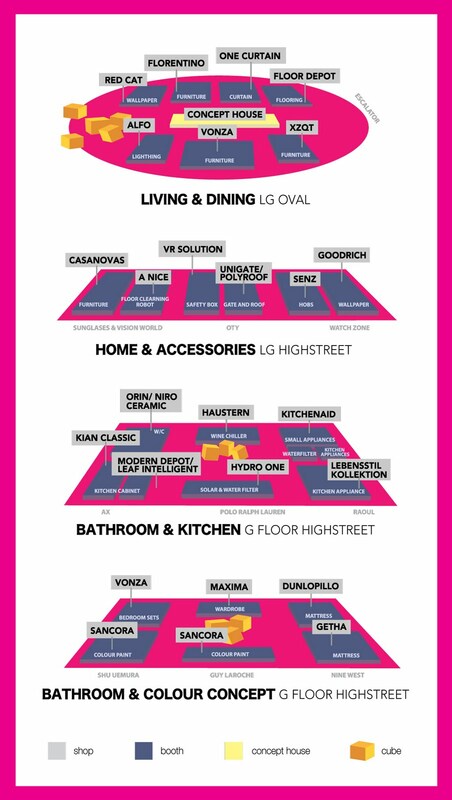 LG Oval will exhibit Living and Dining booths, LG Highstreet will exhibit Bathroom and Kitchen booths while Ground Floor Highstreet will exhibit Bedroom and Colour Concept booths. On top of that, Interior Design Firms will be available for the public to get free ID consultations for their home during the entire 5 days. One of IDEA 1U's main highlights is the inaugural Concept Home project,the collaboration between iN Publishers and Fix Interior. The 6th celebrity home to be tackled belongs to Malaysian born but Taiwan based Rynn Lim. IDEA 1 U will be debuting his living space during the fair for the visual pleasure of the public. Another highlight will be the Creative Concept Cubes on display. A total of 11 Cubes specially design by professional Interior Designers will be scattered around the fair to provide consumers with an in depth idea on how the products at the fair can be used in an actual home setting. There will be activities happening everyday, including special shopping tips and guides by celebrity friends Amber Chia, Angel Wong Chui Ling and also Eric Leong's much acclaimed Creative Home Talk Show. The public can also take part in the Shop & Win contest, and more excitingly, the Cube Count Contest where no initial purchase is needed, prizes up to RM 10,000 up for grabs. As In Publishers also believes in giving back to the community, the company will be selling their magazine publications at a minimum of RM 1.00 during the fair in which the entire amount will go directly to the Charity World Vision organization. The public is of course, welcome to donate any amount more.